This will make a fun Operation Write Home card for someone who has a great sense of humor to send to a kindred spirit! 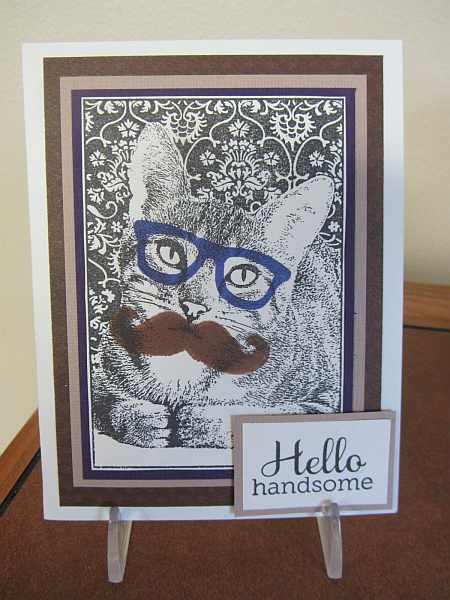 I made this card with inspiration and stamps from the November issue of Craft Stamper magazine (the glasses and moustache). Beware the cat in disguise. Have a great day! This entry was posted on Thursday, November 21st, 2013 at 11:11 pm	and tagged with cardmaking, clean and simple stamping, fauna, Hero Arts, Magenta stamps, stamping and posted in General Cards, OWH. You can follow any responses to this entry through the RSS 2.0 feed.